Walking around the French Quarter we decided to stop off at the iconic (and beautiful) St. Louis Cathedral as a peaceful respite from the heat and a nice place to write for a bit. This is some of what I wrote there. The Cathedral was designed – as all were – to draw the eyes upward, the attention and ultimately, the soul, toward heaven. At first the peasants felt their rough clothes, callused hands, and freshly scrubbed skin acutely – feeling out of place, uneasy, and embarrassed at their poverty and the effects of a difficult and dangerous life. But the calm and quiet reverence would wear away their feelings of unease and they would accept the fact the opulent gilt statuary, soaring columns, and ceiling frescoes of Saints and the Christ peering down, magnanimous, as if through gaps in the clouds, were all intended for them. Each individual worker feeling as if this vast impressive building – this Machine for Devotion – was designed, constructed, and decorated for him and him alone. A personal miracle that helped him forget the world and dream of a higher place. At least for a few precious seconds. Down the center aisle two children – a small boy and his younger sister, almost a toddler – hopped along, playing a game of leaping contrasting floor tiles in a complicated very personal and mysterious children’s pattern. Their feet clomped and echoed through the vast silent space. All the supplicants stared in vexation. “They think they own the place,” everyone thought to themselves – some daring to mumble out loud. And that’s the horror of growing up, isn’t it. At that young age everyone owns the world. Over the next years those kids will come the slow horrifying realization that they own nothing. 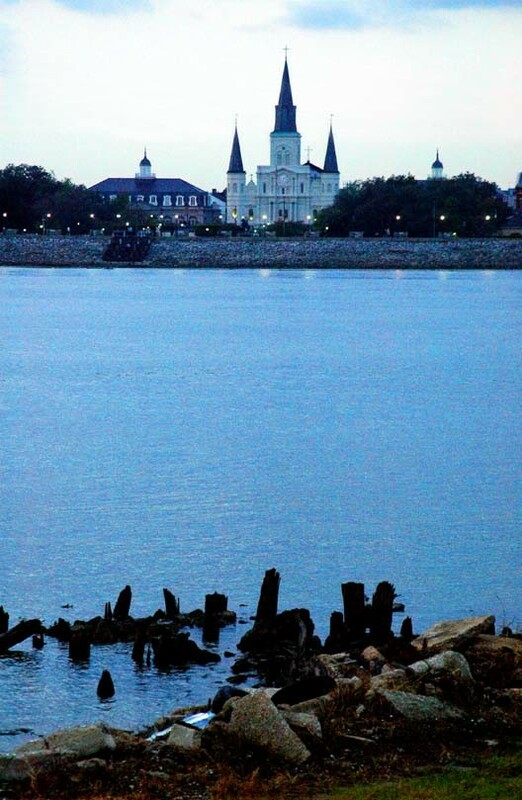 This entry was posted in Writing and tagged cathedral, children, New Orleans, saint louis, snippets. Bookmark the permalink.